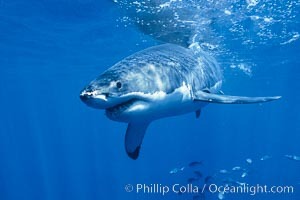 Great white sharks are found throughout California and northern Baja, although they are not common. In fact, they are a protected species in California. Scientific estimates suggest there are a few hundred adult white sharks roaming the state's coastal waters. Areas in central California where white shark feeding activities frequently occur include the Farallon Islands, Ano Nuevo Reserve (site of a large elephant seal population), the Northern Channel Islands and the Marin headlands. Evidence exists suggesting that gravid (pregnant) female white sharks travel to southern California to give birth -- it may be that these waters offer young white sharks better odds of survival. As the sharks grow their metabolism changes, biasing their dietary requirements toward calorie-rich fatty prey, causing them to travel to areas where they can feed upon marine mammals. Guadalupe Island is one such place!